The idea of shady developers willfully trying to deceive iPhone users by gaming the App Store ratings system is not an absurd concept. Patrick Timney, stumbled onto one such developer and what he unwittingly discovered resulted in Molinker, Inc. having all 1,011 of their iPhone apps yanked down from the App Store. Timney confirmed that the removal order came directly from Phil Schiller himself, Apple's senior vice-president for worldwide product marketing. Patrick Timney, who jokingly refers to himself as a pro iPhoneographer, spends a fair share of his time obsessing on iPhone photography, but he's also made a serious hobby out of beta testing photo apps for some of the most highly rated apps populating the Photography category of the App Store. It was well over a week ago when one of Molinker's apps, NightCam Pro caught Timney's eye. "I was honestly interested in their stuff, and I went out of my way to check out their programs," Patrick Timney told the iPhone Savior, referring to Molinker's photo apps. "I really liked their Lomo filter I saw in pictures. Just as I'm about to buy it, I realized something was wrong with the reviews." "This app is quite good, I can not stop playing it. So much love for it." my images wrote. It became obvious that Molinker may have been posting false reviews to lure in unsuspecting buyers. Accomplishing this by allegedly offering free programs to users who agreed to give the apps five star ratings. Two of Molinker's photography apps had already made it into the Top 20 Paid Apps, with Color Magic being featured in Apple's Staff Favorites section on the front page of the App Store. "I compiled every investigative thing I could find to prove my point, including screen shot after screen shot proving that the reviews were bogus," Timney said. "I personally emailed Phil Schiller. On Saturday afternoon he sent me an email from his home, telling me they just removed all the Molinker apps from the App Store along with the ratings." "I figured Apple would investigate my claims, but not yank every app Molinker had in the App Store, Patrick said. "I was speechless, I didn't think that was gonna happen." You would have to be a tad naive to think that any new app receiving a huge slew of five star reviews gained that authentic feedback from giddy iPhone users. There are many quality apps that deserve such ratings and do often earn them one user at a time. But it's obvious when unscrupulous developers are stacking the deck with fat ratings fabricated by blind loyalists willing to mislead in the name of greed. Molinker Inc., may have become the unwitting poster child of such dubious practices, especially if alleged claims of ratings scamming permanently banishes the company from hawking their wares in the App Store. You can bet that the developer community is paying close attention to Apple's swift clean up efforts. The fact that Patrick Timney stumbled onto the App Store's seedy underbelly on his quest for the latest and greatest photo editing app, makes this story a delicious treat that's ready for prime-time television. I asked Patrick what advice he had for the zombie hordes of new developers lined up outside the App Store with a pickaxe in hand, awaiting their chance to stake a claim in the iPhone gold rush. I wasn't too surprised by his answer. "Hard work and a quality product will always pay off," Timney said. 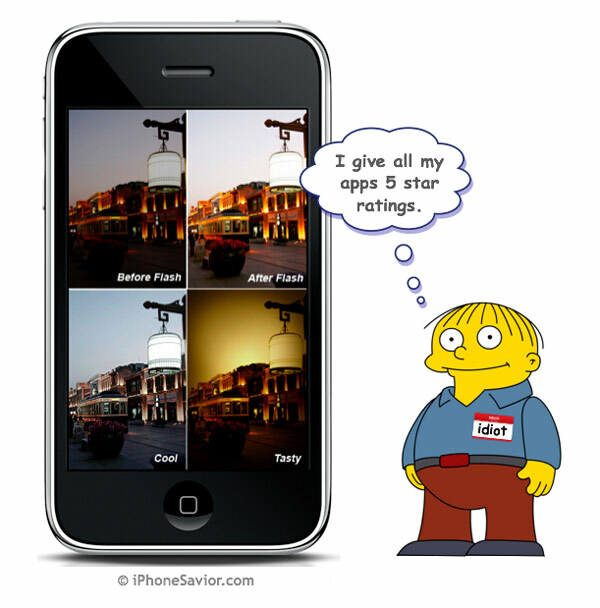 "One of the biggest things I look for when I review photo apps is full resolution images. Full resolution is key, it's a big selling factor." As it turns out, Molinker's NightCam Pro app, did not include full iPhone 3G resolution (1536 x 2048). The app topped out at 600 x 800 resolution when Molinker was caught flashing the full monty. Timney should know, he ended up buying the app just before it became extinct. Some guys have all the luck. Hopefully I can be of assistance to current and up and coming developers. I specialise in the recruitment of iPhone developers and I am a great contact to have if you’re a developer. I have access to some of the best App development companies and I am passionate about what I do! There are so many total garbage apps, totally misrepresenting themselves,I hope their review process starts catching more of the " Get rich.app" for 999.00, or the slew of fake " Find my girlfriends location by her phone number.apps. And more more more. Maybe I should ask apple to create a detective position for me ? I love the idea that Pat downloaded the NightCam Pro app before Apple yanked Molinker. It's like having a lion's head trophy propped up on the wall from an epic hunt and kill. NICE! Cheers! Thank you for such a great interview it was my pleasure! Ofok- Brilliant comment! Friggin hilarious. Thanks for that broseph. It totally made my day. This story is quite good, I can not stop reading it. So much love for it.